The directorate of Technical Education, Trivandrum has invited online applications for admission to Diploma in Engineering/Technology and Diploma in Commercial Practice / Management for the academic Year 2014-15 in the polytechnics of Kerala State through Single Window System (SWS). The 3 year diploma programme which consists of 6 semesters will be based on the credit based semester pattern. 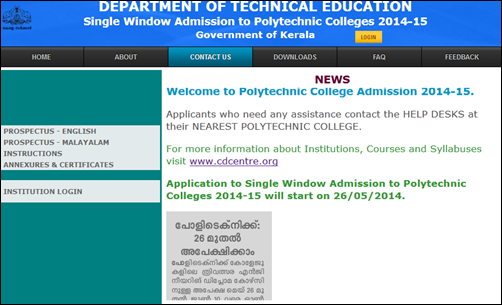 The polytechnic admission 2014 -15 online registrations will start from 26th May. Centralized Allotment Process (CAP) will be done through the Single Window System (SWS) which is being set to give allotments to the various academic programmes offered by the Polytechnic Colleges in each district. The allotment is conducted on the basis of the options submitted by the candidates. Allotments will be strictly based on the options exercised, Rank obtained and eligible reservations for the candidate. Candidates need to register options only to those programmes / colleges which they are sure to join on allotment. Students who have passed SSLC/THSLC or equivalent examination, with eligibility for higher studies are eligible to apply for admission can apply for the polytechnic course. For CBSE / ISCE candidates the marks or grades obtained in Science shall be considered for calculating grade in science in the place of Physics and Chemistry. The selection of the candidate is based on the grading in SSLC/ THSLC or equivalent examination. It is very important to go through the prospectus which is available for free download from the website "www.polyadmission.org" in English and Malayalam languages. The candidates should submit their applications online through the official website. For the benefit of candidates who do not have access to Internet facility, help desks would be established in all the 49 Polytechnic Colleges, to be provided free of coast. Students who seek admission for Polytechnic course 2014 should have to keep in mind about the following important dates. Students can apply for the polytechnic courses offered by the directorate of Technical Education by visiting the official website.